I’ve never really considered myself a hat person. I sometimes find them hard to pull off – anyone else feel that way? I love the way they look on other people, but just haven’t found too many that look great on me. Aside from a perfectly fitted fedora I got from Preston & Olivia a couple years ago, I don’t own any other fall hats. Until now! The day before I took off for London, I was doing a little shopping in Highland Park Village and found this beautiful Eugenia Kim hat at SCOOP NYC! I was actually trying on this Rag & Bone fedora (also a great looking choice!) when I saw the shiny gold band on this hat on display. 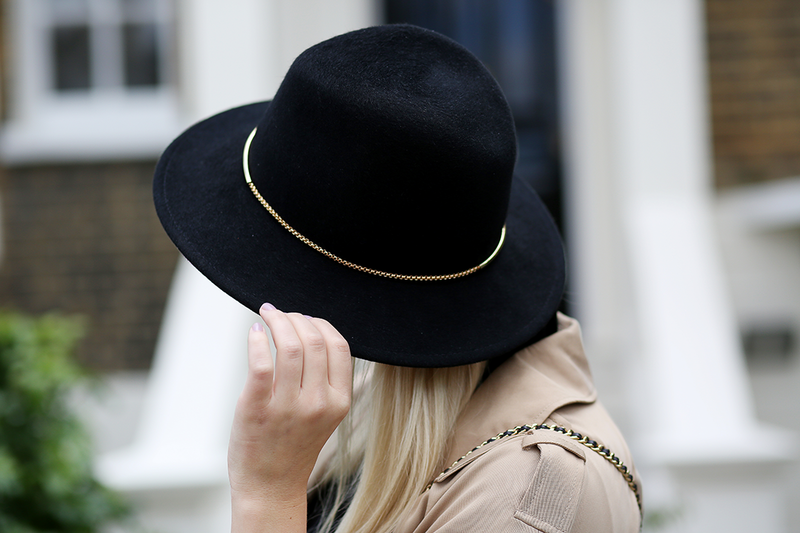 While I love Rag & Bone’s popular fedora, the gold chain on the Eugenia Kim hat adds more of a luxe look which I love. It’s such a chic, timeless piece! Another item I recently added to my wardrobe is this pair of oxfords I snagged at Zara. I don’t know about you, but they look so expensive to me and give those Oscar de la Renta oxfords I love a run for their money! Two fall basics I know I’ll wear again and again. Those shoes are so cute, they pair perfectly with the lace dress. i love this hat on you! paired with the trench and patent leather brogues, its such a classic outfit. Merritt, This ensemble is European chic. And I like it. i’m a cap and fedora girl. I haven’t been able to pull off anything else in the hat department. Those shoes are awesome and I’ve been wanting a pair, I’m just not sure if I can get away with them. I’m short, so flats are not always my first choice. How fun are those oxfords?! I’m all about a comfy chic flat and these are perfect. Love this classic trench and that gorgeous Chanel bag! Love those patent oxfords – I’ve been wearing flats so much more lately & those give this a really relaxed chic feel! LOVE the trim on that hat! Looking so Brit chic my dear! This hat looks adorable on you! Love the gold detail! You definitely do rock the hat so well! Obsessedddd with every piece you’re wearing from the amazing trench to those fabulous oxfords! What a beautiful trip on this hat. I have never been a hat person myself, but now I noticed they add the perfect finishing touch to any look. those shoes are so fun! you sure can rock a hat! Love the trench and the lace detail! You look great in this hat and totally pull it off! I love hats. My problem is knowing when to wear them. I always feel a little silly with them on inside. Love this classic look! The hat looks amazing on you! And this looks like the perfect summer-to-fall transition outfit – love it! Perfect fall basics – they’ll go with so many things. Those loafers look much more expensive than they are – great find! I love hats, and yours is no exception. That dress is gorgeous…love the lace on top. Such a classy chic look.